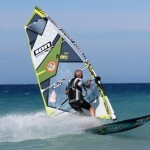 Jeff Brown managed to reach 48 knots (2 sec) and impressive 43 knots average speed (5*10 sec) in just 15 knots of wind. 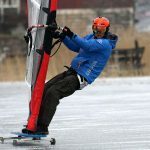 Jeff used his specially designed iceboard sail, Custom JBD 4.0 (1995) and proved that less is more when it comes to sails and ice boarding. 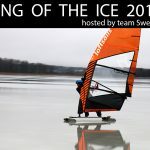 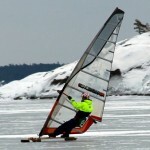 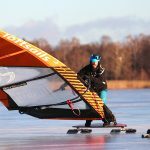 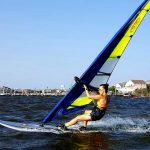 I sailed Ice Cup Sweden last weekend and used a Naish Grand Prix 7,8, which is great if you need acceleration on a small slalom track, but on long speed-runs a large sail is more of a disadvantage. 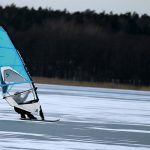 Jeff Brown: “We had miles of near perfect black ice, grade 9. 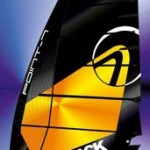 This was some of my best effieciency numbers reaching 48 knots with only 15 knots of wind = 3X wind speed”. 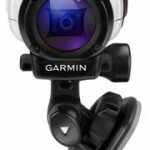 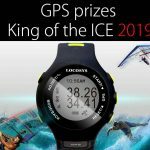 Source: GPS Icesailing.